The Original Duffers Slipper Pattern. This was the first slipper pattern that I designed. It is a simple to knit, felted slipper pattern with only 19 rows of knitting per slipper; it was originally called the 19 Row Felted Slipper Pattern. These slippers are so easy and quick to knit and the possible colour combinations are endless. 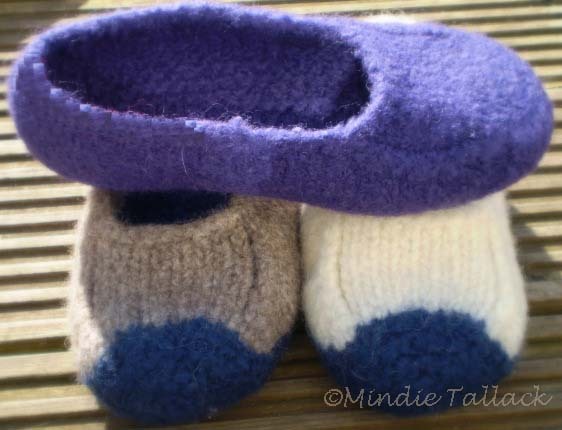 The slippers are knitted flat and then sewn together across the bottom and back of heel. This pattern gives instructions for three adult sizes. Finished foot lengths approx. 27, 29, 31 cm / 10 ½, 11 & 12 inches. Yarn: Any pure untreated wool that will felt in a bulky weight or you can use a DK or worsted yarn held double throughout. Approx. quantities are 150m for the single colour slippers or 100m of the main colour and 50m for the contrast colour if knitting the two colour ones. If you are using DK or worsted yarn held double you will need double the quantities. Suggested yarns are Elann Peruvian Highland Bulky or Cascade 220 held double. The pattern is also available in German and French. For the expanded version with more sizes and three width fittings, see my Duffers - Revisited pattern. Labels: Duffers Original Pattern - 19 row felted slippers.